Recently I entered, Splashes of Red, a local watercolor show. The advertised theme was a clue for the requirement…..use red. Of course, red is probably my favorite color so the requirement started the wheels in motion. 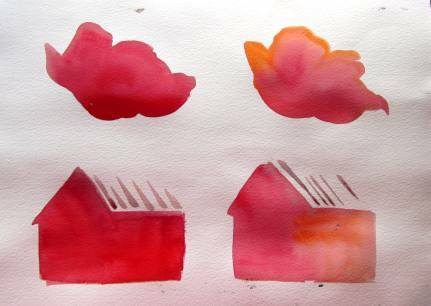 The next question on my mind was what to paint red…flower, barn or something unexpected. I chose the unexpected like many of the other entries. What a refreshing sight to view everyone’s individual painting styles using red. As I strolled through the show it occurred to me painting with red is a challenge…who would think. Red is that brilliant color that springs from pink to crimson in a second and because it is mid value it must be handled with care. 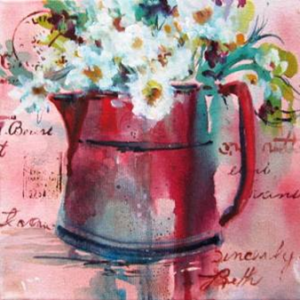 A red flower for instance….most load a brush with red pigment and precede to fill in the borders. The red saturated pigment is established, from the beginning, with little thought to other values in the painting. 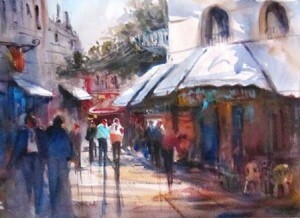 This also applies using other mid value pigments such as Cobalt Blue. Double or triple loading a brush resolves the issue of one value shape or single color hue. 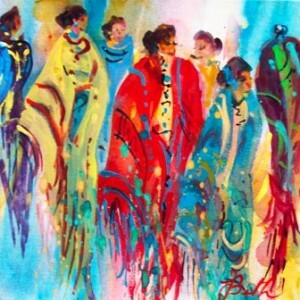 Everyone develops their own technique when applying color….therefore a style is born. Below is a flower and house illustrating the flat red shapes in comparison to the double loaded shapes. The solid red flower and house are committed to a 5 value from the start…where as the double loaded flower and house grade from a 5 to 3 value leaving more value options. When mid value colors are applied in their concentrated state darker values are applied to soon….6 value to black. Below is an illustration of double loading a brush with two different hues….notice the nice transition of dark to light/tone to tone…..
One doesn’t paint too long with watercolor before they understand ‘crop’. A few reasons to crop wonderful creative watercolors: the finished masterpiece doesn’t fit your only available mat…..so crop; a muddy ugly color appears without warning…so crop; the tedious planned composition doesn’t need all the extra fluff to tell the story…whatever the case we have all cropped. If you haven’t you probably should have. Below is the original ‘Fringe People..
A sample of other paintings from the Fringe…..
Painting colorful loose shapes has been my focus for many years. A style that seems to be recognized by those who are familiar with my work. I am a shape painter with few details. Reviewing some old….old notes that were written years ago when taking a workshop from Christopher Shink sparked an interest in tonal values. 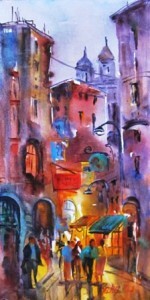 Most experienced painters unconsciously paint the values needed, intuitively. 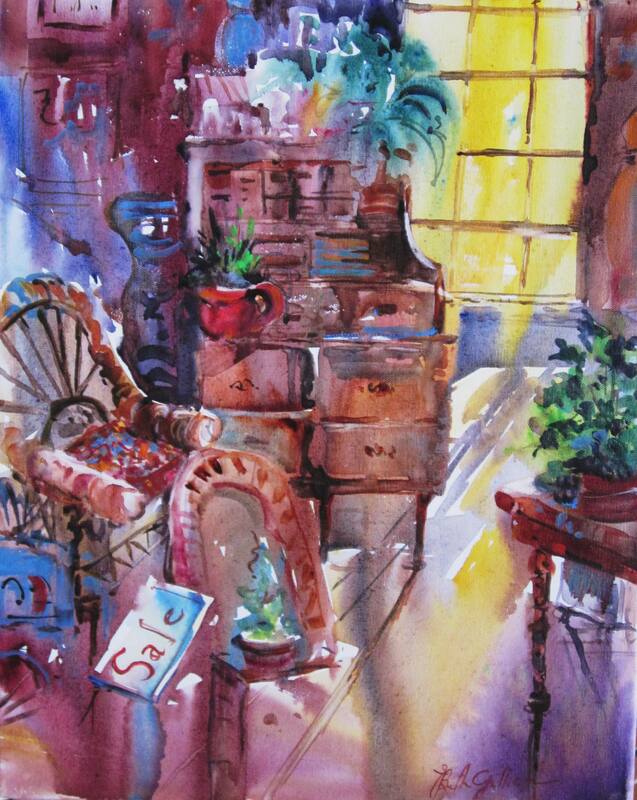 I pulled out a drawer housing half sheet watercolor paintings and began applying principles from the cold notes. Some of the paintings were worthy to be called ‘painting’….while some could use a band-aid. What a great learning tool when those so-so paintings are put under the microscope focusing on an important principle. 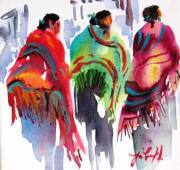 Because color is so much of who I am or want to be….it was overriding value ranges. The painting below is a quick study painted with value in mind with color reigned in…..a corner has been turned on my journey. As much as color dominates my creativity, my palette has been limited to about 7 colors with a few opaques. Sacrificing painting those wonderful negative shapes, which excites me, using bright opaques to enhance the neutrals……. Wow! Christmas celebrations began early around my place bringing responsibility here, there and everywhere. Finishing touches on this dish, one more recipe of candy, last gift wrapped or at least I think it’s the last one feeling good about the accomplishments made just that day. Going to parties, having parties, dressing for this, changing for that enough to wish you hadn’t bought the ticket. After the last fork is washed it’s time to make room for all the things that made their way into your nest. By the time it is sorted, cleaned, stored it’s time to start again. Is this wonderful or what? I had much planned for the start of my new year……work on some ideas that made the mind dizzy with excitement just thinking about the possibilities. Then sinus/flu/allergy made its way through the door and liking the surrounds more than outstayed their welcome. Returning to a horizontal position and reclaiming those once fresh possibilities has been slow going. Hopefully this coming year I can keep up with more dialogue for those visitors to the blog. My first painting for the new year was a fun painting…..12 x 24 on canvas. Sketching a quick cityscape using warm and cool hues with less water and more pigment, I attempted to let the painting paint itself. Liking color can almost be a curse because rather than paying attention to values color seems to dominate. 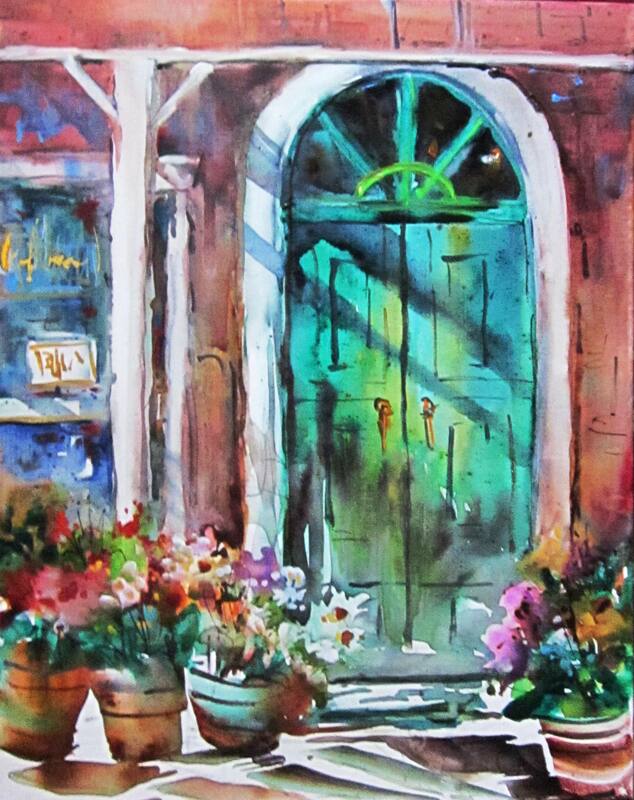 I totally enjoyed setting aside the time to listen to Andrea Bocelli and paint with abandonment…..enjoy and keep painting….I plan too…..
Aaaah! I thoroughly enjoy painting demonstrations, especially when the blue light special isn’t me. Not that I don’t like to show and tell what inspires me to pick up a brush. We tie our shoes, comb our hair, throw on lipstick drive maybe 30 minutes to be entertained by a local or national known artist with anticipation. What are my expectations when I arrive and prepare to observe a painting demonstration, what are yours? Is it an obligation, learning tool, social event or you somehow became the refreshment committee by default? Some of you will relate to all of the above with certainty: there’s the obligated because the demonstrator is your ‘best’ friend, learn something new, socially comparing the latest surgical procedure and of course if you brought cookies we know why you are there. Demonstrations can be filled with unexpected tips of the latest craze or it can put you to sleep. I personally like to have a ‘wow’ moment like…duh! why didn’t I think of that. Wordy demonstrations about how many litters of puppies my spaniel has had since she was rescued can be shared at next weeks dog show. Whether I’m pitching or catching ‘cut to the chase’ is my preference. A new combination of colors, a brush, new painting surface can inspire me and give the week old painting resting on my easel..legs. I’m looking for something to set my hair on fire and because my attention span is just a fraction above a five year old….this native gets restless. I tend to paint quick in that fast forwarded mode…. gravity refuses to show up when the brush is in slow motion. Finishing a demonstration is where the action is or should be. A painting half finished is a painting in progress. I’m a Paul Harvey fan….I want to know the rest of the story. Without a doubt my demonstrations have been linked to all of the above….my apology to those who have suffered through with polite smiling faces. Speaking of demonstrations….below is my demonstration presentation for a great group of fine artists in Brownfield, Texas. A guest artist is always welcomed with encouragement and hospitality from these talented ladies. 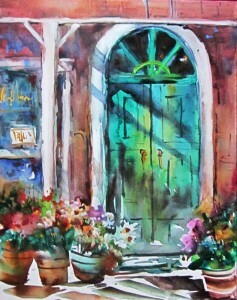 A night time demonstration looks completely different the next day in natural light….this is a 16 x 20 watercolor on canvas. The demonstration was approximately 45 minutes start to finish due to a pending cool front. The next morning in natural light I made a few changes… in fact several changes….modification is the key word. 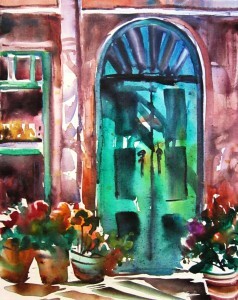 One disadvantage with watercolor on canvas is the lifting of value or hue. If not careful the surrounding hues may also come under attack. Which takes more than a few stabs or brush strokes to put it back……this is before and after. 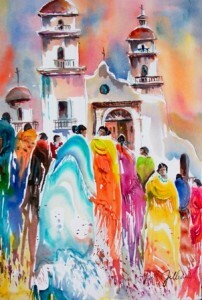 Spent 3 days with a group of talented Abilene, TX.. painters. Workshops have a way of testing me….my weak links forces me to push through until the link has been resolved. I am not sure who learns the most me or those in the class. Again equipped with a camera plus iPad I didn’t take one photo. The only cure to this downfall is to strap one or the other around my neck like a tourist or reporter….missed a great opportunity to post some wonderful finished paintings. 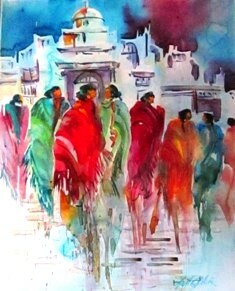 Below is the finished first days demonstration….it is on canvas and watercolor is the medium. Would never have guessed…huh? Thanks to the Abilene Reporter-News for their front page story. It was great exposure for the Contemporary Art Club. 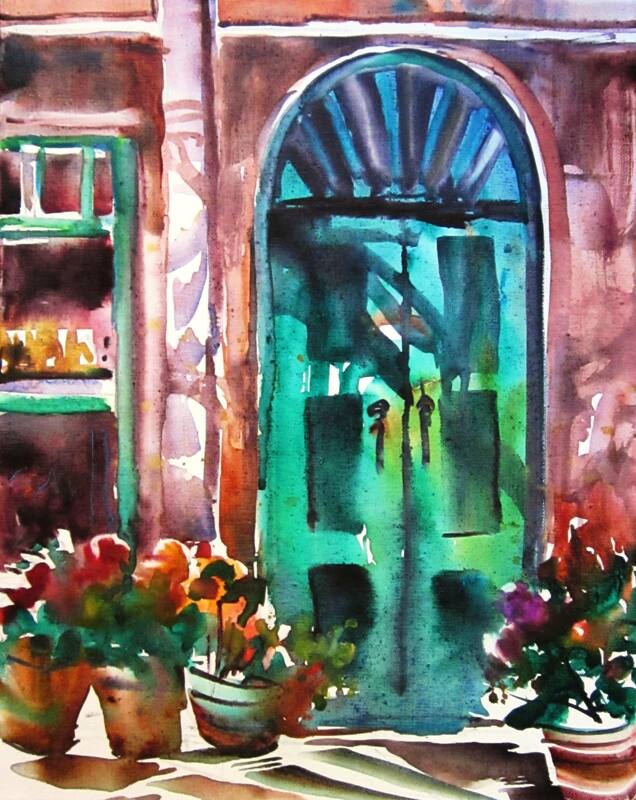 Transparent watercolor has been my choice of water media for many years. The sheerness that veils white paper with soft tints of colors to bold rich dark’s is exciting whatever subject is before me. Several pigments have graced my palette with unsuccessful results..Peach black, Payne’s gray, Indigo, and WHITE to name a few. Well…that’ never rule’ has interrupted the playing field…there are two colors plus white that I can’t seem to paint without. 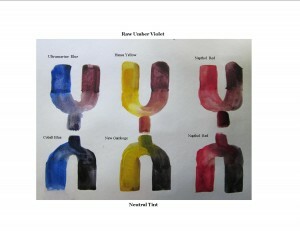 The two hues are Neutral Tint and Raw Umber Violet with white thrown in occasionally. The value of any hue is usually moved to a darker value or neutralized with its compliment….hold up your hand if you’ve experienced that once vibrant color turn an unidentifiable grey. Thought so! 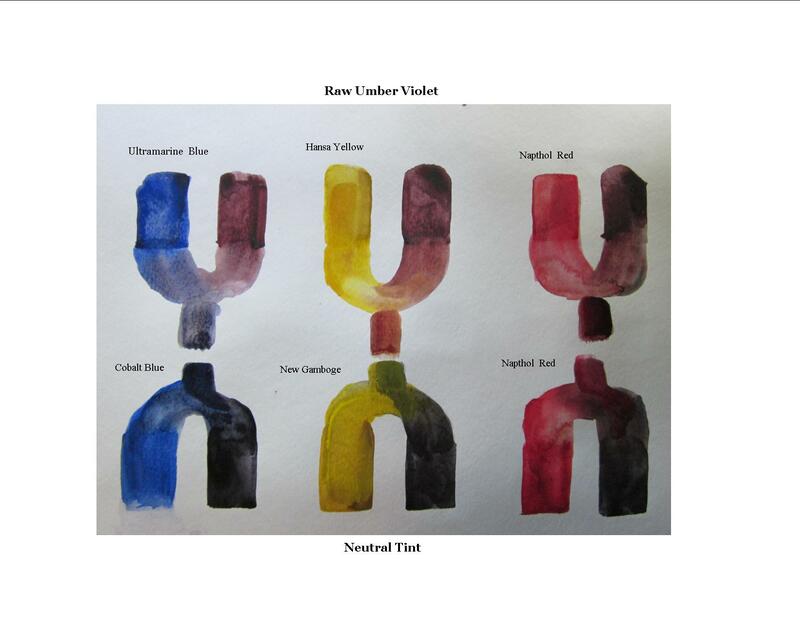 Raw Umber Violet was accidentally added to my art supply order several years ago. A phone call to return the tube of what looked to be dried grape jelly was answered by customer service who insisted I keep it…no charge. Looking at the color in my hand I certainly understood why. Shuffling that tube of color around in my paint bin for almost a year wondering why I pain, come on you’ve had those days…..I picked it up squeezed it out and started mixing with different hues. It was amazing what dried grape jelly could do to Ultra Marine Blue….or red, or green…it know has a permanent place on my palette. Neutral Tint was the other color I ordered for something not sure what and again because waste is not on my menu….started mixing pure color with a touch of the ugly no color tint…wallah! Again sophisticated changes begin to occur and colors where more exciting and didn’t have the look of a dirty hat look of compliments. It too made a permanent home on the palette. 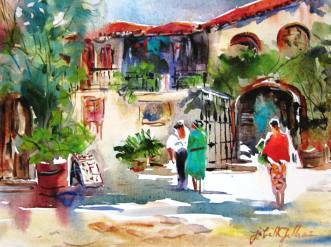 As for white….nothing can replace the glow of white paper or canvas lurking around and enhancing pure color. The use of Chinese White for small highlights on canvas paintings sometime on paper can add just that special touch. Also nice to have when a small amount of opaque is needed…white+whatever and opaque is at hand. Neutral Tint + Napthol Red makes a maroon…deepens the value of pure colors…. Logged in as JoBeth Gilliam. Log out? Do I have a favorite? No! Watercolor paper or canvas each have their own identities. 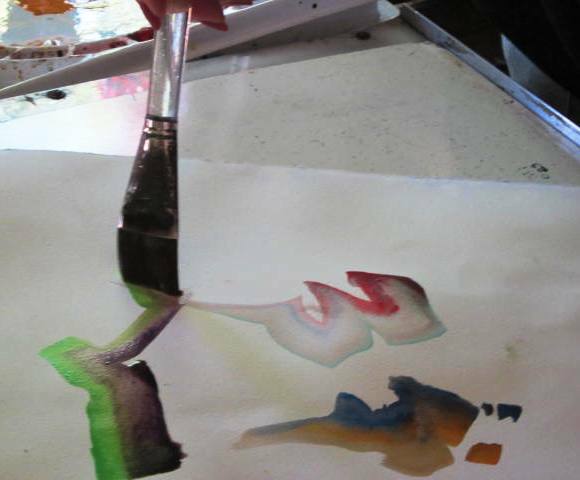 Paper absorbs water and pigment with permission to glaze over dry washes…..canvas likes to be left alone. Pigment lays on top just daring any wash to disturb the fresh painted canvas. 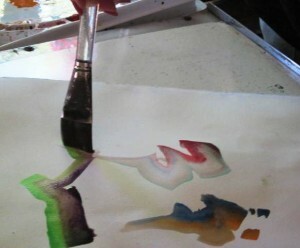 Below are paintings using watercolor canvas…students have two options…paper or explore watercolor canvas….or both…. A color study always precedes my attempt for finished works. This short video shows the three step process. It’s on a quarter sheet 11 x 15 of A’rches 140# rough paper. 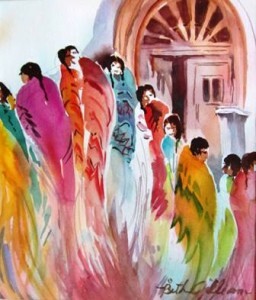 The pigments are mostly transparent watercolor with an occasional opaque for body. Enjoy…. Don't fill in the blanks with what you know!!!! 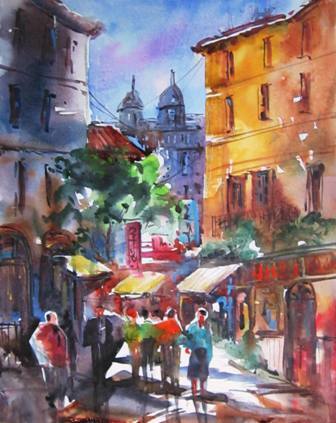 Brush strokes can become boring stroke after stroke...so paint as though the brush has rhythm..